The website provides instructions and tools for extracting raw data for TRAPPIST-1 from the Campaign 12 dataset. In addition, this page will have an interactive forum where you can comment on the data and share your findings with the community. More information on this release will be forthcoming, including announcements about the release, via email, Facebook and Twitter. Questions about the TRAPPIST-1 data release can be directed to our Archive Helpdesk at archive@stsci.edu. The new Virtual Observatory directory search allows users to find thousands of astronomical data sets from a central search interface. Screenshot of the NAVO Directory search interface. MAST is happy to announce the release of an updated search interface for the NAVO Directory1 (https://vao.stsci.edu/keyword-search/). 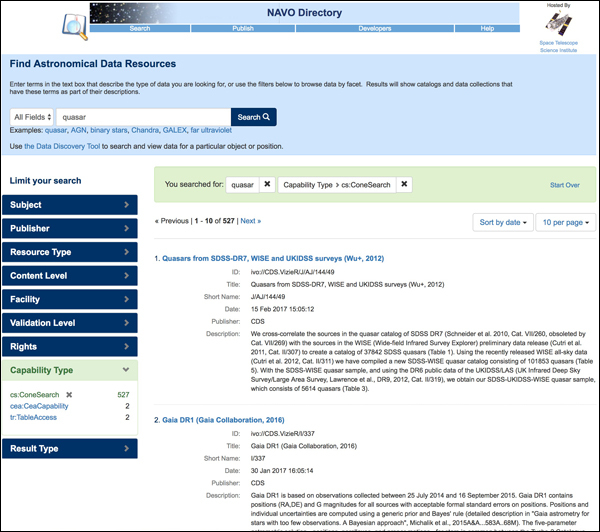 The NAVO Directory collects together thousands of resources across the astronomy community. Most resources in the directory provide access to data through standard interfaces like cone search and simple image access protocol and can be searched via URLs provided in directory entries. Search facets that allow users to browse resources and limit their searches in a number of ways, including by subject, publisher or search capability. A responsive design that works on mobile devices like cellphones and tablets. RSS and atom feeds. Construct a search then paste the URL from the browser address bar into a feed reader to get updates as new items are added to the registry. We would love to hear your feedback about the new search interface and how to make it more useful. To give feedback or to report issues with the service, contact the registry developers at vo-registry@stsci.edu. 1 NAVO = NASA Astronomical Virtual Observatories. 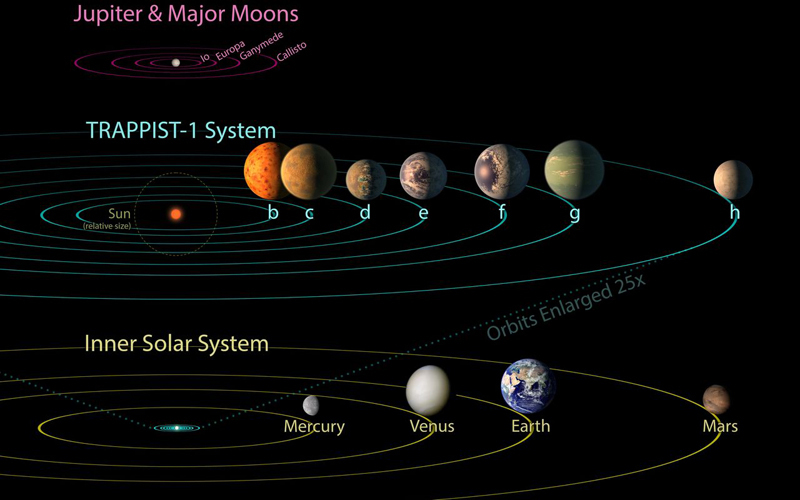 For more information about the NAVO program see http://heasarc.gsfc.nasa.gov/vo/summary/navo_intro.html. For more information about using Virtual Observatory (VO) services, visit http://www.ivoa.net/astronomers/using_the_vo.html. The NICMOS coronagraphic archive is a valuable database for exoplanets and disks studies. The ALICE project uses advanced post-processing algorithms to optimize starlight subtraction and improve detection limits. Figure 1: Example ALICE calibrated image for HIP 79881. Potential companions are circles. 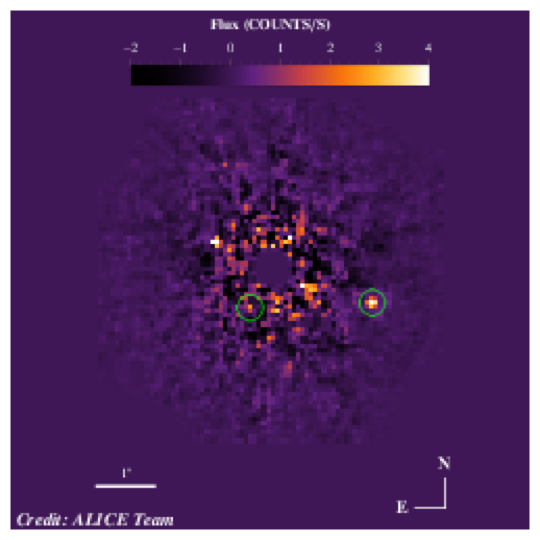 ALICE is a project led by Rémi Soummer at STScI that revalues the NICMOS coronagraphic archive, resulting in improved detection limits. Approximately 400 targets were observed with NICMOS from 1997-2008. Using advanced post-processing algorithms combined with improved calibrations from the LAPLACE initiative, the team has created new, calibrated images for most of the NICMOS coronagraph targets. The team has also created a FITS file format designed to not only accommodate ALICE files, but can be extended to future data sets from other IFUs or data cubes. Given the time baseline between these archival observations and current observations, we anticipate this new HLSP can be quite useful for candidate companion searches in particular. Questions about the ALICE project can be emailed to the Archive Helpdesk at archive@stsci.edu or posted on the MAST Forum. This newsletter is a MAST publication produced by Jonathan Hargis and Randy Thompson, on behalf of the entire MAST staff, who welcome your comments and suggestions.